There was much excitement at Lochter last week when our two best fishers arrived! All the way from Africa, for a season of sport at the fishery. 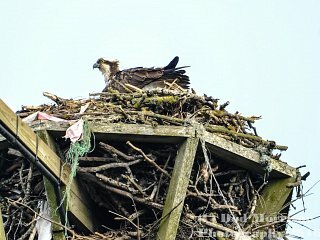 I am speaking of course about Branson and Libby our own visiting pair of ospreys. They both look fit and healthy after their long flight and Libby lost no time in Spring Cleaning the nest while Branson collected twigs and did a spot of fishing. Our customers love watching them go about their daily business so if you haven’t seen them before it is well worth a visit with a plus being that you can view them on the nest on our HD quality nestcam linked to widescreen TV’s in our conservatory restaurant. On the human fishing front this week it was very much that Buzzers and Small Nymphs were the most effective method. To prove this fishing buddies Dougie Mair and Billy Ferries shared 17 fish between them on Buzzers and Diawl Bach combinations, Rab Bell netted 11 solely on Buzzers as did Steve Prince who on two consecutive days caught 10 and 8 fish respectively and Paul Sharp had 12 fish to the net. Looking through the returns book Andy Stuart has 13 on green and Black Goldheads, Jim Taylor from Newmachar had 11 on Semtex and Orange Dancer and Greg Michie from Turriff had 9 fish on Hothead Dancers and Tadpoles. With the weather remaining slightly colder than of late it would appear that these methods mentioned will continue to work well for the weeks ahead. Tight Lines. There was much excitement at Lochter last week when our two best fishers arrived!